After arriving in from a little red, rustic airport in Kiruna, the transfer to Abisko is about 90 minutes long. Weaving between trees covered in snow, you know you are in Arctic Sweden very quickly. Abisko National Park is known as one of the places in the world with the best chances of seeing the northern lights. The only place you can stay in the National Park is the Abisko Mountain Station. On arrival at Abisko the hotel is very prominent, as lights shine from it and nothing else is around. You instantly get a feel like it’s going to be a great place to see the Northern Lights without even going up the chair lift. Having dropped our stuff in our room, we were straight off to the chair lift to go to the Sky Station at the top of the mountain for dinner. 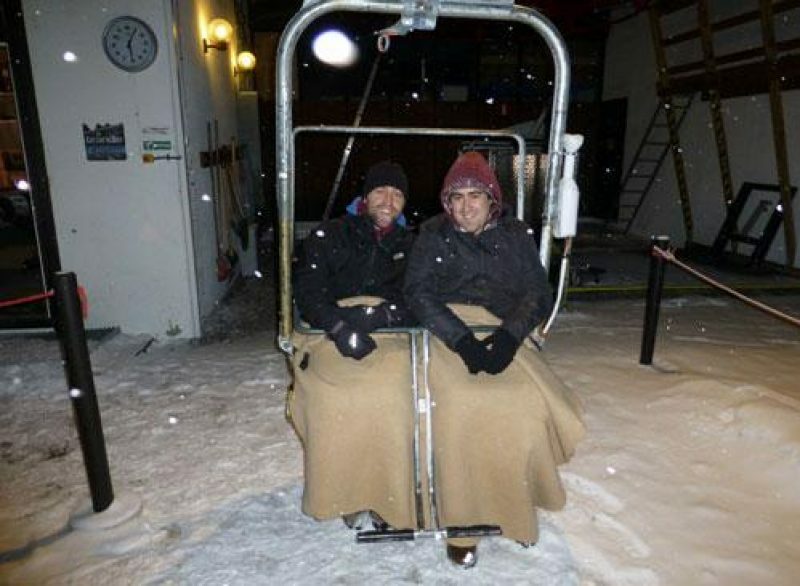 Guests who choose to have dinner at the hotel are escorted up to the chairlift later in the evening. The chair lift is about fifteen minutes walk from the hotel, it’s well lit and the path is easy to follow – although you’re accompanied there by the Discover the World rep. The trip up the mountain lasts about 20-30 minutes, depending on the people traffic, and it can be a cold journey so make sure you wrap up warm! The guide showed us where to put on the full snow suits that you can borrow for the evening to keep yourself warm, and there are extra blankets to have over your knees on the way up. They were needed the evening we were there! The meal at the top was an amazing four course dinner with produce from Sweden. It was a set menu (as all the ingredients have to be brought up the mountain) and it was absolutely delicious. The first course was a type of local fish roe which was interesting; I didn’t dislike it but it wouldn’t have been my first choice. Then was a cauliflower soup which was really fresh and warming. The main course was reindeer with a local berry sauce: amazing. Finally, the pudding – the local berry pannacotta. Mmmmm, mmm, mmmm! That was worth going for alone! The Sky Station itself is quite a small building, with a big deck for looking out for the northern lights. You really are up in the heavens and away from everything, including light pollution – so should the Northern Lights happen whilst you are up here it must be the most amazing place. 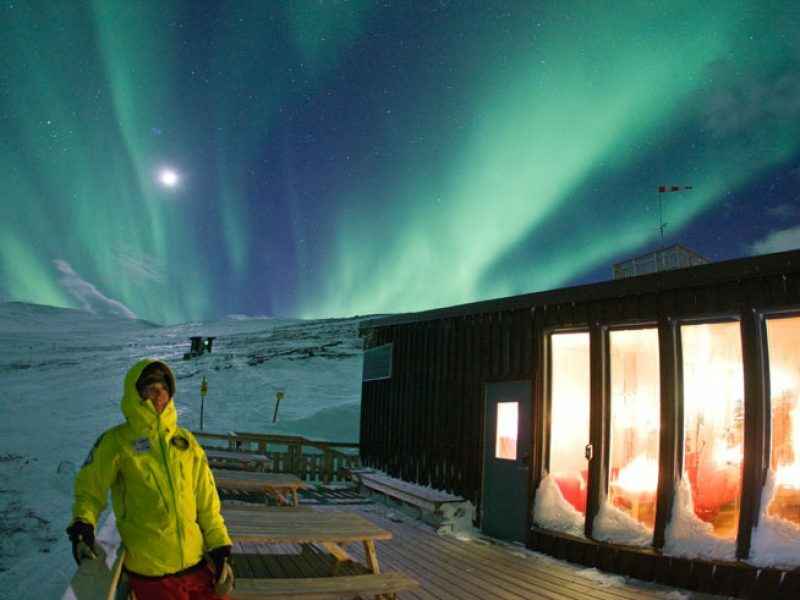 Doug was checking out our Northern Lights, Abisko & the Icehotel itinerary. 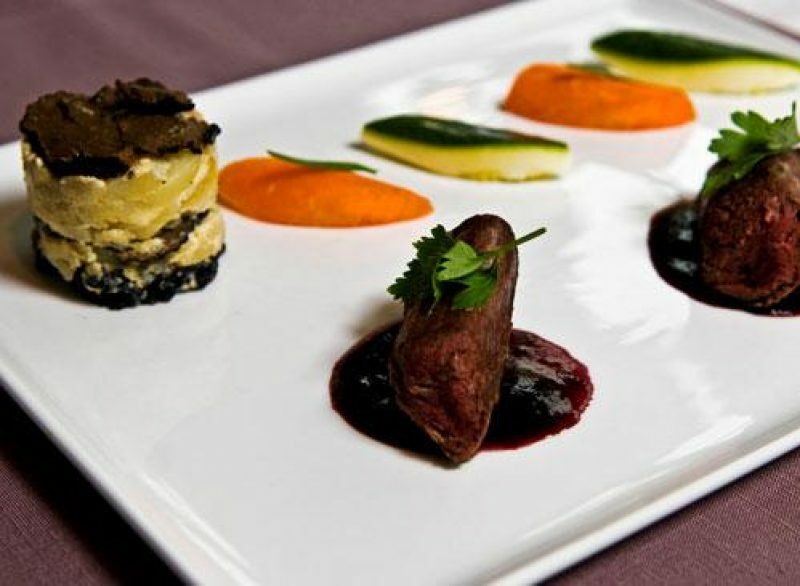 The gourmet dinner at the Sky Station is available at a supplement and gives you extra time to enjoy this breathtaking location with a four-course Nordic dinner and a guided tour of the station’s facilities. Contact our team of Travel Specialists to find out more. Abisko National Park lies close to the Norwegian border in Swedish Lapland. It is recognised as the most reliable place in the world for northern lights sightings, where displays can be more intense or prolonged than anywhere else. From waking up in a suspended glass cube – high in the treetops, to falling asleep under an aurora display inside a cosy glass igloo, there's nothing more relaxing than spending a night amongst truly spectacular surrounds.